NWOBHM band FIST certainly have had quite the career! From starting out in South Shields, England, under the original name AXE back in the 70s, they were only known for one song (their only song), “S.S. Giro”. They weren’t pleased with the popularity of Rock and Roll – especially Heavy Metal – at the time, so AXE went on hiatus. Afterwards, the band decided to turn a new leaf with under the name FIST, and they brought along bassist John Wylie in 1979. Then, thanks to the emerging NWOBHM trend attempting to seize the crown of the UK’s Punk scene, FIST was under contract by New Wave legends Neat Records, and later to MCA. FIST’s debut album “Turn the Hell Up”, and their single “Name, Rank and Serial Number” were released in 1980, and they did some tour time with UFO after the release of their second single “Forever Amber”. 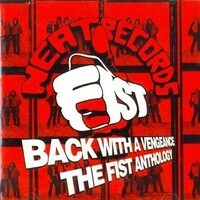 Unfortunately for FIST, and their original take on the genre, they weren’t garnering many new fans. MCA, displeased with not finding their own personal IRON MAIDEN and with FIST’s other demos, the band’s contract wasn’t renewed after their release of “Collison Course” in 1981, and they, yet again, experienced another hiatus and an uncertain career. In 1982, the band is taken back by Neat Records, who are surprised to learn FIST has been gutted and have replaced their front man, rhythm guitarist, and bassist with new blood. They released their sophomore album under the fitting title “Back With a Vengeance”. Sadly, their efforts to sound cleaner and more melodic were not rewarded. FIST later tried to appeal to the mainstream with their catchy cover of DION’s “The Wanderer” but even that failed to take. FIST resigned in 1985, ready to fade into obscurity forever in the coming years, until 2001 when the original front man Keith Satchfield decided to rouse the band from their slumber and set about tinkering the sound for their comeback album “Storm”, but FIST just can’t catch a break and “Storm” isn’t received well, either. The band went back to sleep. “Back With a Vengeance: The Anthology” contains thirty-three songs total. Every song that FIST released from 1979 to 2002. With over an hour of listening time, the album is best listened to on a road trip (which is exactly what I did). FIST doesn’t write the typical songs associated with NWOBHM. If I’m being honest, they sound more like THE WHO or QUICKSILVER MESSENGER SERVICE. They write conceptual tunes about aviophobia (“You’ll never get me up (in one of those)”), getting smashed (“Going Wild Tonight”), hanging with friends (“The Hole in the Wall Gang”), etc. They obviously have some standard Metal concepts like murderous lovers (“Brain Damage”), getting murdered (“Terminus”), and of course, delivering the best Heavy Metal riffs (“Turn the Hell On”). FIST obviously sounds like they fit right into their niche back in the day, and it’s puzzling how they ever got lost in the noise, drowned out by so many other NWOBHM bands. For a classic, perfectly preserved look at a band that was lost in the rise of NWOBHM, give FIST a listen. Turn the hell on!